The odd-numbered months bring YARN in the mail! 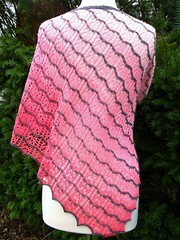 Specifically, gorgeous hand-painted sock yarn from Blue Moon Fiber Arts, from their sock club line. Yay! I think we’re still in the spoiler period, so I will follow rules and say only that the colorway is beautiful (stash page here), and that I’m doing the not-sock pattern (project page here). If you click on links, that’s up to you — spoilers abound!